Anyone who has peeled back the shabby corners of some of the best loved fairy stories will know the true, dark depths that lay beneath and the twisted idea of what once passed for happily ever after. Eschewing the modern, demure approach to these tales, Playlogic swings an axe at all things saccharine and serene and in bulging-eyed style, takes no prisoners. Boasting ‘gallons of blood’ and ‘dynamic slicing’, Fairytale Fights, despite its deceptive look, is no jolly picnic through a happy fairytale land. Indeed, our four heroes, Jack (Mr Beanstalk), the Naked Emperor, Little Red Riding Hood, and Snow White are all painted as slightly warped, twitchy, trigger happy lunatics, whose stories risk fading from memory as the new kid in town schmoozes his way into people’s fickle affections. With a pristine tunic and golden hair, the Little Tailor has taken over the stories of our ‘insignificant’ heroes and won the hearts and simple minds of Taleville’s people with his jaunty but underhanded exploits. With their fame fading, what can our four do but reclaim their glory with a healthy dose of visceral slaughter and mayhem underwritten by the flimsy excuse of pursuing porridge kettles and kidnapped, narcoleptic princesses. No bunny, buxom wench, or golden haired child is safe from the slicing, bludgeoning carnage - just as it should be. Scooping the prize for unlikeliest use of the Unreal Engine this decade, Fairytale Fights eschews the greys and gunmetals that traditionally go with the sort of games which utilise this workhorse and has instead conjured a lush world with a vivid palette of colours that wouldn’t look out of place in a traditional Nintendo offering. 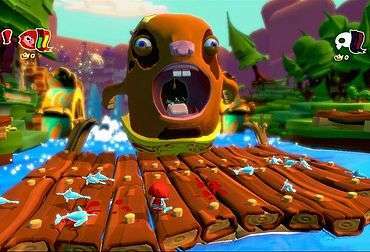 Unlike anything really seen on the Xbox before, (with a few, more peaceful exceptions), this game boasts an engaging concept and a wealth of colourful, innovative backdrops and rich, imaginative levels, not to mention blood by the bucket load. Primary colours and cutesy character may be the order of the day, but the twisted way in which the game delivers these things is a fiendish, hand rubbing delight and this contrast is rarely less than satisfying. The humour on display here is delightful, from blink and miss moments in the background, to the achievements, such as slaughtering Seven dwarves while playing as Snow White for the ‘That’s Gratitude’ achievement. The array of weapons is vast and you haven’t lived until you have pummelled a lecherous prince to death with a violin or melted enemies by vomiting acid over them. The weapons range from the deadly and bizarre ‘Spoon of Destruction’ and ‘Twig of Destiny’, to the surreal ‘Marshmallow on a Stick’, ‘Beaver Mailbox’, and a ‘Waffle Iron’. If you should find yourself short handed, grabbing a nearby gnome, bunny, or rat will serve as a useful weapon until something better comes along. The twee colours don’t, for one moment, mask the dark humour, meaning that blended princesses, incinerated children and arguably one of the greatest looking bosses in the form of a stitched, conjoined Hansel and Gretel, give this game some great moments. And it needs them, because the problems are legion. There are many good elements to Fairytale Fights, but in reality, the basic things that it claims to be are a let down and the deceptive backdrops belie the game’s actually rather disappointing and limited feeling, side-scrolling nature. The hack and slash element is maniac and fun until you run into clusters of enemies whose attacks decimate your health in one combo, leaving you stunned and unable to respond for another salvo, resulting in several deaths before you can extricate yourself. Bad respawns cause more deaths than they should and if you find yourself sans weapon at some of the stickier points, progress will be excruciatingly painful. 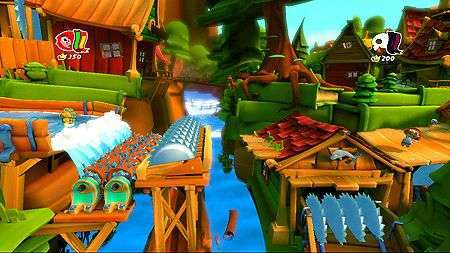 Similarly, the platforming elements are very much hit and miss. On one hand, the theory is fantastic, with some engaging and imaginative recipes for great platforming, such as traversing deadly saw-blades, escaping a crumbling candy castle while pursued by gingerbread men, and navigating some fantastic shelves of bric-a-brac in the Giant’s house. However, the stubborn camera fully intends to disrupt any progress as much as it can with it’s obtuse angles making judging depth a nightmare, leading to far more money haemorrhaging deaths than is reasonable. Boss battles swing from the oddly easy to the bewildering to the hair ripping variety and are one sly way in which the game robs you of your carefully collected horde of gems and riches, meaning that when you limp forlornly back to the hubland and open your bloodstained purse, you realise that the upgrades for your illustrious statue will have to wait. For a very long time. Given the game’s lack of similar competition and aforementioned plus points, it is easy to find certain problems forgivable, especially given the fun to be had in local multiplayer. However, Fairytale Fights seems to have reserved it’s worst for the ultimate kick in the throat. A significant number of achievements are glitched, some irreparably so until a patch arrives – in fact, I have never known of a game with this many issues right off the bat. Multiplayer over Live is virtually unplayable, with vanishing characters, invisible enemies, terminal slow down, disappearing weapons, and game crashing chaos conspiring against you. Also, should you have made the quite reasonable error of completing the single player campaigns first (the difficulties don’t stack I’m sorry to say), then thanks to a shocking glitch, you will have rendered yourself unable to pop the multiplayer completion achievements…something that if you are unlucky, you will have only discovered after several arse numbing playthroughs at six plus hours each. A few more months tacked onto the release date might have allowed these problems to be caught, but as it is, they are a very glaring stain on what should be an entertaining and unique romp. If the rumours are correct, then several last minutes changes were made to bring the game into line with its desired age ranking, (not least the amusing but predictably kneejerk garnering ‘kill 1000 children’ achievement), which is possibly a contributing factor to the oddly long glitch list. When all is said, done, and slaughtered, Playlogic have created an entertaining game, full of cartoony character and over the top, blood drenched action, but the flaws and bugs mar this twisted delight in a very off-putting way which is a crying shame. 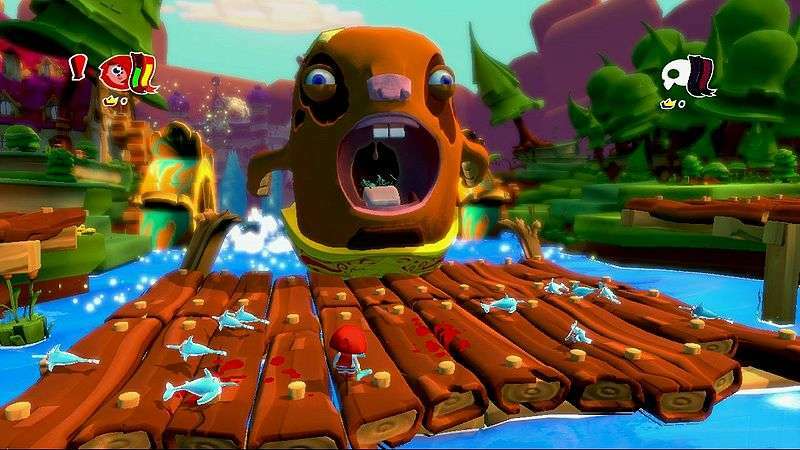 Only the patient and fearless will pursue this game to the bitter end of an as-of-yet, elusive maximum gamerscore and although Playlogic have announced free DLC with up to four new characters promised, I fear that much of their audience have already hung up their Rainbow Swords and gone home. 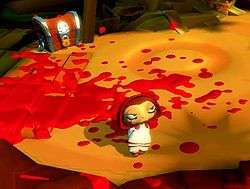 Full of character and colour, this game, despite being a great concept with a dose of dark humour, doesn’t quite make the ‘better than average’ ground that it perhaps should have, thanks to a myriad of problems and an unforgiveable list of glitches. Flaws aside, until it gets the patch it so desperately needs, Fairytale Fights certainly won’t have a happily ever after and that’s a real shame.